Houston - 09 September,2012 : Dr. Deepak Chopra won’t tell you to take two aspirins and call him in the morning. Instead he’ll tell you to practice meditation, reflection, yoga, seek happiness through creative fulfillment and that’s exactly the message that was delivered in his calm, incisive way at the Akshaya Patra fundraising dinner held at the Westin Galleria on Sunday, September the 9th. The event was attended by a host of personalities like Harris County Judge Ed Emmett and his wife Gwen; Madhu Sridhar, President and CEO of Akshaya Patra USA; Dr. Desh Deshpande, Chairman of the Board of AP USA; District Judge Sandill as well as prominent members of the Indo American community. Chopra said on the occassion, “Akshaya Patra is a perfect example of what happens when creativity and compassion come together.” Bringing technical expertise to the table with a sense of compassion has enabled Akshaya Patra to become the largest nonprofit organization to provide a wholesome midday meal daily to 1.4 million school children in India in a cost effective manner. Often their only meal of the day, this acts as an incentive for economically backward children to continue coming to school, which is a simple solution to promote education and eradicate poverty. Dr. Deshpande explained how Akshaya Patra works. The foundation currently needs $30 million a year for its midday meal program. Of this, $18 million comes from the Government of India, $2.4 million is donated by Indo Americans and the rest is raised in India by generous corporate partners. “Do the math – it costs only $30 to feed one child for an entire year!” he added. The food is prepared hygienically in centralized, state-of-the-art kitchens and delivered to schools in custom designed trucks by noon. The empty containers are taken back to the kitchens to be cleaned and readied for the next day. This program covers 9,000 schools in 10 states of India and all this is done by incorporating environmentally friendly practices.The beauty of the program, according to Deshpande, is that it provides local cuisine using local produce and local support. What this means is that a child in South India would get rice, sambhar and yogurt which is their staple food whereas a child in North India would get roti, dal, and a vegetable curry. Deshpande urged the audience to skip the Taj Mahal on their next visit to India and visit an Akshaya Patra kitchen instead.The results of Akshaya Patra’s efforts are heartwarming. Enrollments, attendance and performance levels in schools have shot up. Three weeks ago, Akshaya Patra served it billionth meal. Their next goal is to feed 5 milllion children by 2025. Deshpande’s address was followed by an appeal by Ashok Rao, the emcee for the evening, to the audience to donate and “donate until it hurts.” With his tongue in cheek humor, Rao cajoled and coaxed everyone to open their checkbook, wallet and heart. It wasn’t long before the contributions started pouring in with Deshpande promising $116,000 and the Steering Committee of Akshaya Patra, Houston matching it. Chopra donated $70,000 while Arpita and Amit Bhandari, Nimmi and Mukesh Turakhia as the main sponsors donated $50,000 each. The other chief sponsors – Peggy and Avinash Ahuja; Nidhika and Pershant Mehta; Leena and Ash Shah and Anuradha and Mani Subramanian – also made large contributions. The tally steadily went up with almost everyone present contributing anything from $100 and above. Those who weren’t whipping out their checkbook were warned by Rao that their food would taste like dust. His style must have worked as a cool $600,000 plus was collected during the entire evening. The fundraising and a delicious dinner catered by Madras Pavilion was followed by the highlight of the evening, a talk by Chopra, who Time magazine has described as “the poet-prophet of alternative medicine.” An endocrinologist by profession, Chopra is better known for his path breaking work in the field of mind body medicine and human wellbeing. He believes that brain chemicals such as serotonin – the feel-good hormone – and emotional states of the mind have a huge impact on our brain chemistry, immune system and our overall state of health and wellbeing. In other words, a happy positive mind is the key to a healthy body. So how does one go about being happy? At His Holiness, the Dalai Lama’s urging, Chopra along with a group of scientists and physicists got together to study the concept of happiness. In two years they returned with their findings and a happiness formula. Studies clearly showed that happiness is the goal of all goals and happy people are more successful, have better relationships and better health. The formula for Happiness is H = S (Set point in the brain) + C (Conditions of living) + V (voluntary activities). Chopra further explained that Set point determines almost 50% of our daily happiness. The brain recognizes a situation, finds an opportunity and rises to the challenge of solving it and this brings happiness. Conditions of living make up 10% of our total happiness and are related to one’s circumstances. The third part of the formula is about the voluntary choices we make in our lives. It could be as simple as shopping which brings us temporary happiness whereas finding meaning and fulfillment in your life brings about a more permanent happiness. Chopra also asked us to understand the human body as a body of consciousness and said that humans are endowed with divine attributes like love, happiness, insight, compassion and it is with these attributes of the soul that the process of healing begins. Healing is the return of the memory of who we are and if we do not heal ourselves by our divine attributes, we face extinction. At the end of Chopra’s talk, there was a brief question and answer session. In response to a question about life, Chopra said that life is progressive realization of worthy goals, the ability to find the creative source within and to eventually merge with the Divine. About The Akshaya Patra Foundation: The Akshaya Patra Foundation is a non-profit organisation headquartered in Bengaluru, India. The organisation strives to fight issues like hunger and malnutrition in India. 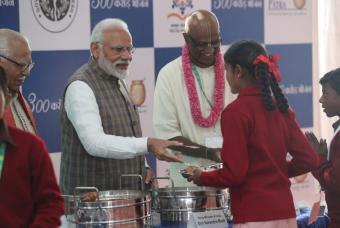 By implementing the Mid-Day Meal Scheme in the Government schools and Government aided schools, Akshaya Patra Foundation aims not only to fight hunger but also to bring children to school. Since 2000, the organisation has worked towards reaching more children with wholesome food on every single school day. Akshaya Patra Foundation is continuously leveraging technology to cater to millions of children. Its state-of-the-art kitchens have become a subject of study and they attract curious visitors from around the world.